Max Pacioretty has been red-hot over the past week and a half. He’s on a seven-game point streak, scored eight goals, and has tallied multiple points in each of the last three Golden Knights games. Finally, Pacioretty is breaking through and displaying the skills and production that was expected of him when he was acquired for Tomas Tatar, Nick Suzuki, and a 2nd round pick. However, as we do on every goal in the hockey, we need to award an assist for Pacioretty’s turn-around, and it goes to Alex Tuch. A single stat illustrates it best, so we’ll start there. The table shows how many goals were scored and how many goals were allowed, at 5-on-5, when Pacioretty and Tuch are on the ice together, and when each has been on the ice without the other. As you can see, there is a significant amount of time on ice for each of the three situations. Max Pacioretty has not been on the ice for a single Golden Knights goal, at 5-on-5, when Alex Tuch was not also on the ice. However, Tuch has been out there for six without Pacioretty. Also, Max has allowed seven without Tuch, while Tuch has only allowed two without Pacioretty. To illustrate the point even further, in 122:42 in which Pacioretty played with Eakin and without Tuch, the Golden Knights allowed five goals and didn’t score any. Add Tuch onto the line, and they’ve scored 10 while allowing just 5. The table gets confusing when we add all three players, but we’ll show it anyway. Pacioretty has scored five goals while playing at 5-on-5 this season. In the five goals, Tuch has an assist on all five and he has the primary assist on two of them. Tuch also has a major impact, by that I mean, there’s no way Pacioretty scores without Tuch doing what he did, on three of the five. Quite simply, Tuch is driving the play for the line that has turned around Pacioretty’s season. Now, it’s important to note that this is not an article trying to point out that Pacioretty is not a good player, or that Pacioretty isn’t red-hot and has been a major impact for the Golden Knights turnaround. Instead, it’s to show that it took the Golden Knights a bit of time to find the right fit for Pacioretty both in linemates and in role. He’s becoming the finisher on a line with two terrific forecheckers and fast skaters. He’s settling into the low-slot position on the power play, where he’s scored most of his non-5-on-5 goals. And most importantly, he’s not missing when the chances have arisen. But finally, the main reason for this article is not to be negative to Pacioretty, it’s to be insanely positive towards Alex Tuch. He has been the driving force behind Pacioretty’s resurgence and he may deserve as much, if not more, credit for Pacioretty going from 2 goals in 16 games to 10 in 23. Since returning to the lineup the Golden Knights are 10-8-1, but they are 1-3-1 in games in which he does not have a point. Thus, 9-5-0 when he has at least one point and 6-1-0 when he gets multiple points, which he has done in three of the last four. Tuch starts rush, works puck to Eakin who gives it to Pacioretty. Tuch picks up the puck behind the goal, feeds Pacioretty, shot stopped, puck worked back to Tuch, drives to the net, Pacioretty scores on rebound. Good entry from Pacioretty, lays puck to Tuch who makes a great diagonal pass to Eakin. Another good pass from Eakin to Pacioretty and Pacioretty scores it. Tuch through neutral zone with speed, gets it to Haula who chips it in to the zone. Haula creates turnover behind the goal, gets it out to Pacioretty who scores. Luckily, it’s only a quarter of the regular season that top defenseman Nate Schmidt will miss action. 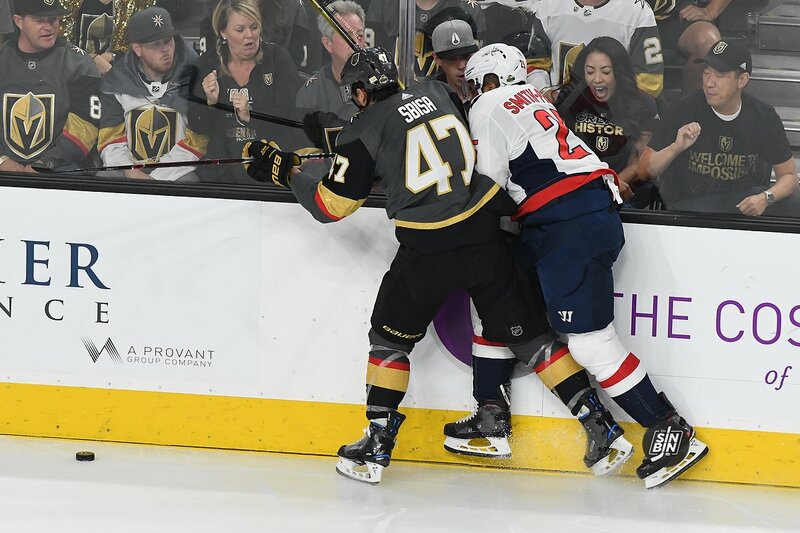 But, while that story continues to unfold, Vegas’ other top defender Shea Theodore also remains unsigned and the possibility of a holdout is real. With one defenseman guaranteed to miss a large chunk of time and another sitting in contract purgatory, what are George McPhee’s options? He can ride it out with organizational depth like the team did last season when Marc-Andre Fleury was injured. The GM could make a move for a defenseman, and not necessarily Erik Karlsson. Maybe, McPhee will wait it out and hope a desirable defenseman will pop up through waivers. Or, he can reach out to an available old chum. In 30 regular season games, Luca Sbisa averaged 19:31 TOI, and averaged 2:22 shorthanded minutes per game. Many of those games he was paired with Schmidt and drawing the opposing teams best players. Although Sbisa was injured for much of the 2017-18 regular season, he added defensive impact when he hit the ice. Some credit the Swiss defenseman for helping Schmidt convert to Vegas’ top d-man. Also, the veteran Sbisa was a strong, protective teammate that held a presence on the ice. With Schmidt’s guaranteed 20 game absence, signing Sbisa could be a move Jack Adams winner Gerard Gallant would appreciate. The 28-year-old UFA was heavily used early on in 2017-18, and after returning from injury, the coach used him in the lineup, including the Stanley Cup Final. At this time, Gallant could use a familiar veteran like Sbisa to help right the defensive ship. The former Golden Knight knows the organization, system, players, and city. Most importantly the coaching staff is comfortable playing Sbisa. Depending on Sbisa’s demands, the Golden Knights should be able to re-sign the left-handed defenseman to a deal comparable to what Jon Merrill and Deryk Engelland make per season. This late in the game they might even be able to get him on a one-year deal. It could be well worth the low money risk for a recognizable insurance policy like Sbisa. Not only will he fill the burden of Schmidt’s suspension, Sbisa would also secure a roster spot in preparation for Theodore’s possible holdout. He’s not a replacement for either but Sbisa could effectively fill important minutes for twenty or more games. Luca Sbisa's agent confirmed to SinBin that the Golden Knights have NOT reached out to him regarding Sbisa. He also said Sbisa would be interested in returning to Vegas if the Golden Knights come calling. Where Does The Blue Line Stand Now With Schmidt Out Of The Picture? I think a more likely move is to play Collin Miller with McNabb. Sbisa is a good third pair guy. Gotta have a goals against under 3.0. We dont and we will not make the playoffs. Unless your Pittsburg.